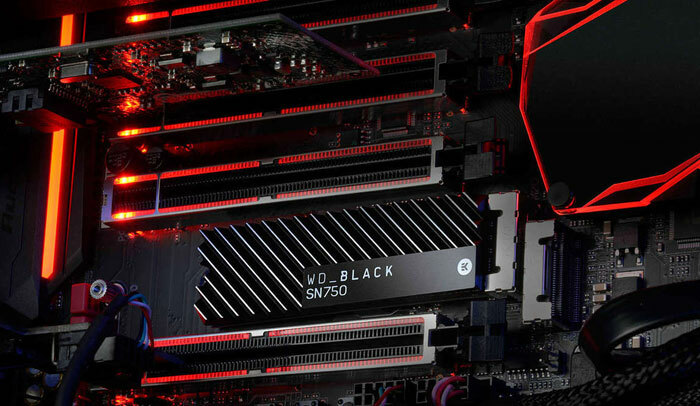 WD has launched the new Black SN750 NVMe SSD, an M.2 form factor storage device aimed at gamers. Capacities range from 250GB, through 500GB and 1TB, to 2TB. The other option a purchaser has is whether to plump for the chunky looking heatsink. As a device aimed at gamers and enthusiasts, WD had examples of its Black SN750 NVMe SSD o show at the PAX South show at the weekend. It was showcased for desktop systems and custom gaming rigs with and without the heatsink. With regard to gaming, WD's marketing department asserts that the heatsink, helping to maintain temperature and speeds will provide "a tangible, next-level competitive boost during intense PC gameplay". WD goes on to say how greater capacity SSDs are now in demand for gaming as it has become common for installs to be as large as 100GB per game. If you like the industrial design of the heatsink, you can thank EK Waterblocks for that, as it collaborated with WD over the design. This is a passive cooler, using chunky fins, and will become available when buying capacities of 500GB or greater from spring. 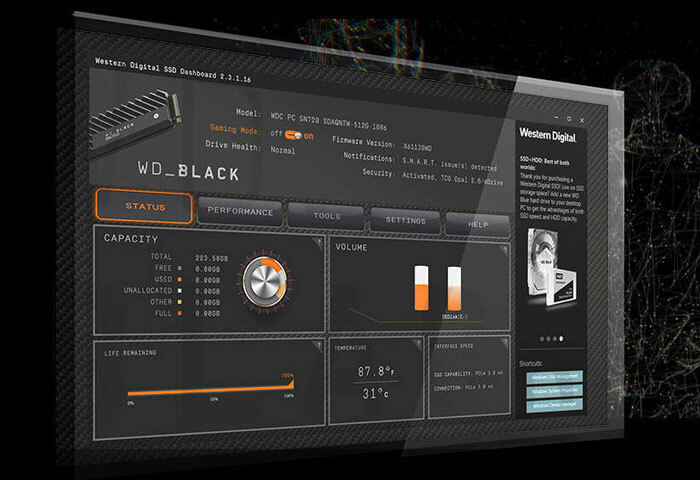 Another nod to gamers comes from the WD Black-exclusive SSD Dashboard, which features a gaming mode. In effect toggling this will "disable low power mode and keep the SSD running at peak levels for longer sustained execution," explains WD. 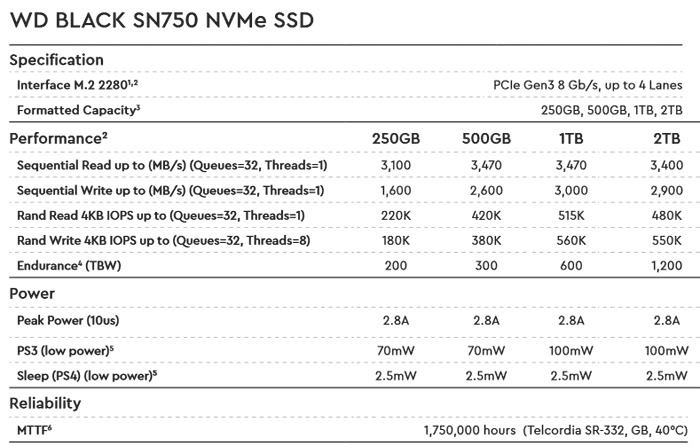 I've included a chart with the key performance specs of the WD Black SN750 NVMe SSD line, above. As you can see the peak sequential read is up to 3,470MB/s, and sequential write up to 3,000MB/s. Additionally, the SSDs feature up to 515,000 random-read and 560,000 random-write IOPs. Whichever model you choose the measurements are that of a standard M.2 2280 stick (22 x 80mm), except that the heatsink equipped version is a couple of mm wider and quite a lot thicker at 8.1mm (rather than 2.4mm). In an email to HEXUS, WD said that all models come with a five year warranty, and they will be priced from $79.99 up to $499.99 MSRP USD. As mentioned above, the heatsink equipped models will become available globally from spring.